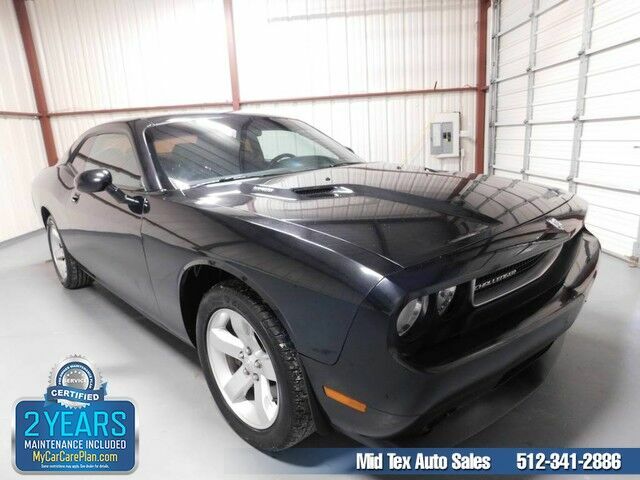 Mid Tex Auto Sales is excited to offer this 2010 Dodge Challenger. When you purchase a vehicle with the CARFAX Buyback Guarantee, you're getting what you paid for. A Dodge with as few miles as this one is a rare find. This Challenger R/T was gently driven and it shows. Surprising quality accompanied by a high level of performance...this Brilliant Black Pearl on Dark Slate Gray Dodge Challenger R/T could end up being the perfect match for you. More information about the 2010 Dodge Challenger: The 2010 Dodge Challenger is instantly recognizable and one of the most distinctive new cars of any price. With a thoroughly modern design, the Challenger manages to maintain an aggressive V8 muscle-car personality while meeting modern expectations for ride comfort, handling and safety. It's certainly not old-tech inside either; Chrysler is offering some of the best tech features inside, like a hard-drive-based music jukebox system. Among coupes, the Challenger is surprisingly practical; Dodge says that it has best-in-class rear headroom and legroom; it's also best in class in trunk space. Interesting features of this model are modern tech and entertainment features, cargo space, smooth ride, responsive handling, and Classic muscle-car appearance Visit Mid Tex Auto Sales online at www.midtexautosales.com to see more pictures of this vehicle or call us at 512-341-2886 today to schedule your test drive.